Hi Pakwheelers, hope everyone is doing fine. 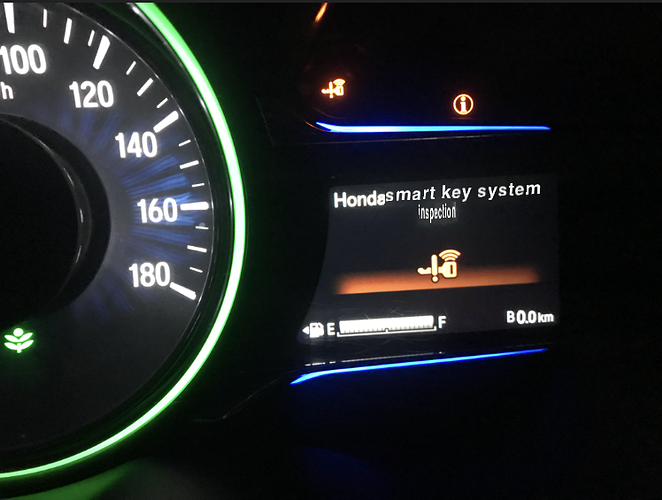 From the past 2 weeks, I'm getting the following error: "Honda Smart Key System Inspection" on my Vezel Z 2015. I've replaced the battery of my Smart key and get the error refreshed by the OBD Scanner, but after a day or two, the error appears again. Then, I've got it checked again and the mechanic told me that it is the error of 'Start/Stop Engine Switch failure' as the error code appearing on OBD Scanner is B12C5 which is related to Start/Stop Engine Switch failure, and I need to get it replaced. Now, I'm worried about it, any one here can help me in this regard please or suggest me a good expert mechanic from whom I can get this error fixed? I'll be grateful. I'm based in Islamabad/Rawalpindi region. Thank you. No one is here to help me? I can only sympathize with you. Finding a good mechanic and that too for a car like Vezel is very difficult. Hope you find help. Thank you for your sympathy, and yes finding an honest and a good mechanic for such a car is very difficult, any help will be greatly appreciated. Anyone from Rawalpindi/Islamabad region who is aware of an honest and good mechanic for my Honda Vezel from where I can get it checked. Hope to hear from anyone soon. Thank you. I only logged in because I felt your pain and therefore I too would like to sympathise with you as well. I would like to inform you that I too am having the exact same problem on my 15 Vezel Z (picture attached hopefully). However, mine comes and goes. Sometimes for over a couple of weeks or other times for a couple of days. I was told by Nazir Electrician (G8 Markaz) the exact same thing that the start stop engine switch needs to be replaced and that the smart key battery is not at fault. I have not replaced it yet. If I do replace it or you would like to go to the electricians place together, we can do at. Just inbox me your number and we ll fix the problem together. How does that sound? Thank you for your reply. This error on my Vezel '15 also comes and goes, just like you mentioned. By the way brother, for how long you were having this error? I've also consulted Nazir Automobiles (Abdul Sattar) and he also suggested me to get it replaced, but also told me that if you can manage to bear this error on the screen, it won't trouble you in the long run, but it can only be removed by replacing that Start/Stop Engine Switch. Has the Nazir Automobile quoted any price for the new Start/Stop Engine Switch to you? For now, I've decided to bear this error on my screen and get along, but may be I can get it replaced, if the problem get worsened. Guys, any updates on this? I also got that error, did you get it fixed? I am in Lahore and also getting same problem since this morning. If you guys got any solution please share? Aslam O Alaikum , dear I had the same issue with my Honda vezzel 2014. and by pushing the start stop button around 10 times the problem has been solved. Pass ker ya berdasht ker.. So me doing the same..hope all u do the same..
Bs ab ley jo lee hy to berdasht he kerna parry ga..
One try i did and got batter result..if u guys try hope get batter result. Keel full pressure on brake paddle...while starting...and keep push button press for 5 6..second....the error mostly venish. Ohhh. I thought I am the only one. Facing same issue and after Google it just concluded to change the push button. It appears and disappears after every two days. Looking for good mechanic and quality services. Did anyone got some concrete solution, as i faced it today. 2016 34k driven..